Stoatin Brae in Augusta, Michigan plays tribute to the great links courses across the pond. I hate to break a secret, but for years Chicagoans have ventured two hours northeast to two incredible golf destinations when looking to get away from it all. They don’t want you to know where they go for fear of overcrowding (like that’s something they aren’t used to)! Fortunately for our readers, MGM was invited on a Southwestern Michigan Familiarization Trip this summer and can now give you the skinny on Benton Harbor and Augusta, Michigan. 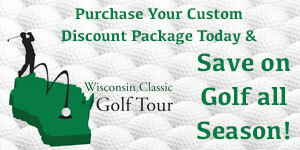 Both destinations are connected by I-94 and offer easily accessible, affordable golf for couples or buddies groups. We know how much the game of golf gives back to local charities, but in the case of Harbor Shores Golf Club in Benton Harbor, Michigan, the advent of a championship golf course has changed the fortunes of a struggling community. One of the strongest heartbeats of this revitalization is 18-time major champion and Harbor Shores’ designer Jack Nicklaus. “With Harbor Shores, we set out really to change a community,” Nicklaus began. “This wasn’t just about a golf course. This was a non-profit project. That’s the important part of it. When we started, we had a factory where the first tee is. We had to remove toxic waste and buildings. But in the end, the whole course looks beautiful and we hope is enjoyable to play,” ended Nicklaus. If you have the chance to see the before and after photos of the property your jaw will drop. More than 117,000 tons of trash and debris were removed from the site that is now Harbor Shores. That is enough trash to fill a football field goal post to goal post, seven stories high. Four short years after the first piece of garbage was removed, the 2012 Senior PGA Championship was contested at Harbor Shores. Thanks to an amazing partnership with KitchenAid, Benton Harbor’s largest and most influential employer, the PGA Tour Champions major will come to southwestern Michigan during every even year until 2024. The biannual event offers the chance to show the golf world the beauty of the property, but it is the other 102 weeks that truly shows off Harbor Shores’ impact. “Harbor Shores is the foundation for economic growth and development in Benton Harbor, bringing communities together through golf, real estate, youth programs and social activities,” began Ross Smith, General Manager & Director of Golf. “The Harbor Shores development has helped to lead the ongoing revitalization of Benton Harbor by creating new jobs, increasing the tax base, stimulating new consumer spending and focusing on creating new opportunities for the local citizens. The golf course has been the cornerstone of this revitalization,” stated Smith. The golf course is also one that cannot be labeled by conventional words such as links, parkland, or woodlands, as the par-71 track tumbles and heaves through all three types of styles plus throws in five holes along the Paw Paw River for good measure. The 436-yard, uphill par-4 7th features a tabletop green and a stunning view of Lake Michigan. Our golf media group was honored to attend the press conference hosted by management titan KemperSports announcing the seventh real estate phase at Harbor Shores, dubbed Harbor Village. The 72 lot development is adjacent to the Inn at Harbor Shores, which is the stay and play hub of the entire property. “With six unique real estate offerings, Harbor Village will appeal to varying demographics, from young professionals to vacation home owners and empty nesters alike,” states Kerry Wright, Director of Sales and Marketing at Harbor Shores. “The community reaffirms Harbor Shores’ commitment to economic growth and redevelopment, connecting Benton Harbor and St Joseph,” said Wright. For more information on how you can be a part of this thriving community for a day or a lifetime, visit www.harborshoresgolf.com. Midwest Golfing Magazine has always been impressed with golf-centric families that dream big. No bigger dreamers can be found in the Midwest than the Scott family (Darl, Charles, and Jon), who developed a 108-hole golf empire in Augusta, MI (a country suburb of Kalamazoo) over a 55 year period. Gull Lake View Golf Club and Resort has the calling card of being not only Southwestern Michigan’s oldest but also its largest golf resort. With six championship courses in a condensed area, Gull Lake gives golfers the chance to never play the same hole twice within a week’s vacation. You’ve heard the old line, “Which one of these are not the same?” The easiest answer at Gull Lake View is Stoatin Brae, Michigan-based Renaissance Golf Design’s masterpiece that just opened for public play last fall. Parkland golf move over, as a big, bold, brawny links style course has entered the scene. Situated on one of the highest points in Kalamazoo County, Stoatin Brae, which means “The Grand Hill” in Gaelic, is everything an Irish Links course should be. The bump and run shot is back in vogue as most approach shots must land 10 yards short of the green to have any hope of staying on the putting surfaces. The fairways play fast and firm and the putting surfaces are as true as ice or fire. Stoatin Brae is the ultimate mix of drivable par-4s, 200 yard plus par-3s and go for broke par-5s surrounded by fescue grasses and a myriad of mind-bending bunkers. This is a four hour thrill ride that needs a permission slip, or at least a road map to help along the way. My advice, enjoy the remarkable scenery and do not get discouraged when good shots leave you using your hybrid off the green for your third or fourth shot. This is the game our forefathers played across the pond and it is one to be embraced! Forbes Magazine recently named Stoatin Brae one of top nine new courses in 2017 and with good reason. Our group was blown away by the rolling naturalness of the 6,742-yard layout as it appeared no dirt was moved to complete the project. My favorite stretch on-site has to be holes 12 through 14, which is comprised of two stunning par-4s and a downhill par-3 made for photo opportunities. In short, holes 91 through 108 have catapulted Gull Lake View Golf Club and Resort into a higher echelon destination. “Catapulted is a great word, but the thing is, before Stoatin Brae was built Gull Lake View was still one of the biggest and best resorts in the country. With the addition of Stoatin Brae it has allowed people such as yourself to come and experience what we have to offer as well as getting to see one of the best new courses of 2017,” offered Dean Kolstead, PGA Golf Professional and Director of Golf.